GroVia O.N.E. Diaper - Snow - EcoBaby Gear, Inc. The O.N.E. 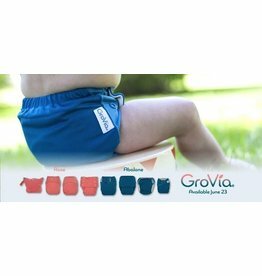 is a GroVia product which is truly an all-in-one diaper, fitting 10 - 35+ kiddos. Excellent absorbency, no need for boosters and double layers. The Channeled soaker design is very trim, yet absorbent. Choose between hook and loop or snap. You will love these diapers! It's simple to use, which makes it great for pre-school and babysitters.